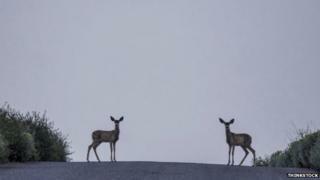 Motorists have been warned to look out for deer on roads in Scotland. Scottish Natural Heritage (SNH) said the risk of collisions would increase when the clocks go back this weekend. With night falling earlier, peak commuting time coincides with deer coming out to feed on grass verges near roadsides, the conservation body said. The most recent research suggested there were more than 7,000 collisions between vehicles and deer every year across Scotland. An average of 65 of these crashes result in human injuries, SNH said. The combined economic value of these accidents, through human injuries and damage to vehicles, is estimated to be about £7m. Only break sharply and stop if there is no danger of being hit by following or oncoming traffic. Try to come to a stop as far away from the animals as possible to allow them to leave the roadside without panic, and use your hazard warning lights. Be aware that more deer may cross after the one or two you first see, as deer often travel in groups. After dark, use full-beams when there is no oncoming traffic, as this will illuminate the eyes of deer on or near a roadway and give you more time to react. But dim your headlights when you see a deer so you don't startle it. Report any deer-vehicle collisions to the police, who will contact the local person who can best help with an injured deer at the roadside. Do not approach an injured deer yourself - it may be dangerous. Warning messages will be displayed on electronic road signs from Sunday until 17 November to warn motorists at key locations across west and north west Scotland, including on the A9, A87, A82, A85 and the A835. Sinclair Coghill, SNH deer management officer, said: "From October to December, there is a higher risk of deer on the road as deer move down to lower lying ground for forage and shelter, with the highest risk from sunset to midnight and shortly before and after sunrise. "We advise motorists to slow down and watch for deer crossing roads. Be particularly alert if you're driving near woods where deer can suddenly appear before you have time to brake. "If you do hit a deer, report it to the police, as the deer may be fatally injured and suffering."